Oh crap. He's already shipping? I better send my stuff in then to get me one. Thanks for the update. Nice!! I do not display my playsets. They take up too much room. I really like the way you have your Simpson Toys displayed. Here is how I have my figures. I pretty much have them in order from when they came out. WOW! That is some great displays guys. Wow Boba Binks another line of stuff you collect! I love the Simpsons. "No Beer and No TV make FX-7 something something"
Newforce has the Future Burns and Bobo Smithers set up for PreSale...$28.99 shipped. Neat set! Cool! Is this an exclusive or will it be a wide release set? This weekend at the mall I stopped into Electronic Boutique and they had series 12 of figures for $5.99 each. I did not buy them yet. I will soon. Wave #12 is at Target in Indianapolis!!! I picked up all six; Mr. Plow Homer, Don Vittorio, Mr. Largo, Luann Van Houten, Database, and Number One. 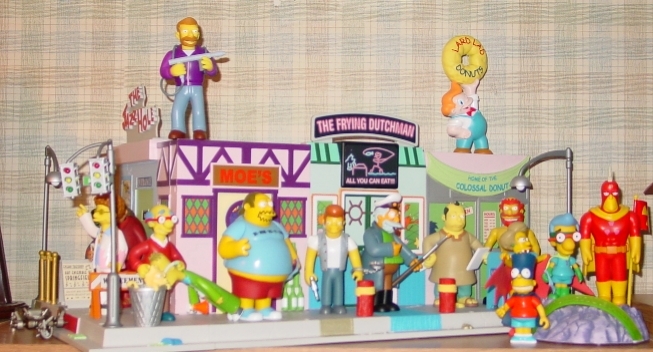 They did not have the Bart Treehouse with Military Bart. This series has the Mail Away Be Sharp Skinner. No sign of the reapack (and repainted) Moe or Burns? Nice score! Does this wave contain the Repaint Moe and Burns? I did not know this. I have not seen them. Thanks. I will keep my eyes open for them.